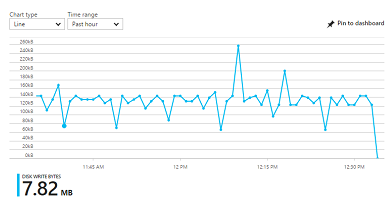 Recently I needed to monitor the free disk space on some Linux VMs on Azure. Each VM had a different VM size, which means different OS Disk size, Temp partition size, etc. In addition, some VMs had an extra Data disk, while some others did not. The aim was to monitor and create alerts for each partition separately. This is something that Azure does not offer out of the box. Instead, it requires some extra effort to achieve this. Since I realized that there is actually not good enough documentation on the net, I decided to share my experience hoping that it will be helpful for others too. The good thing is that Azure provides an extension for such purposes, which is called “Linux Diagnostic Extension”, known also as LAD (don’t ask me why LAD and not LDE). 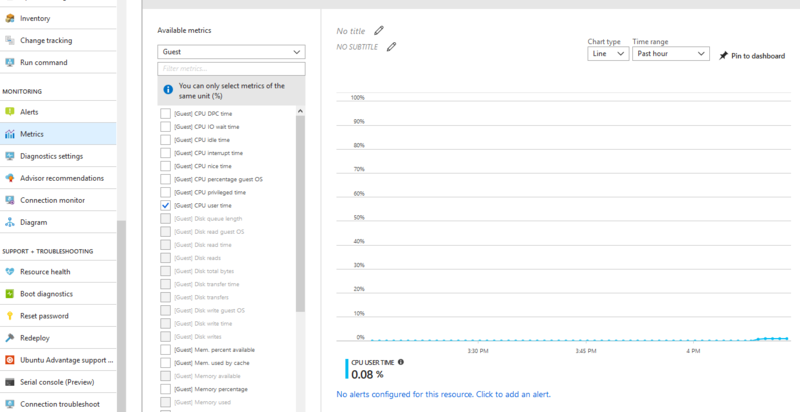 The version provided out of the box in Azure portal is 2.3 .However, the metrics provided by this version are very limited in comparison to the newer 3.0 version. So, the first step is to upgrade to version 3.0 . The 3.0 version cannot be installed using Azure portal. Instead, one has to use Azure CLI 2.0 for this purpose. However, even after you upgrade to 3.0 you still don’t have detailed metrics for each separate partition in your Linux VM. All you get is an aggregated metric for the sum of your partitions. This is very frustrating, since what is needed in most situations is a value of free or used space for each partition separately and not for the sum of all of them. 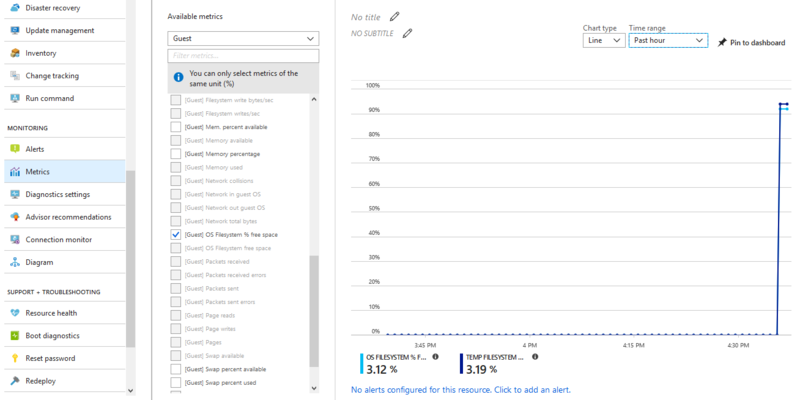 Microsoft provides some information on how to create custom metrics, but it seems that it does not help much on this task. This is why I created this guide. So, let’s start by creating a new Linux VM on Azure. Chose a VM name, credentials, etc as you wish until you reach the third step where you are asked about VM Settings. 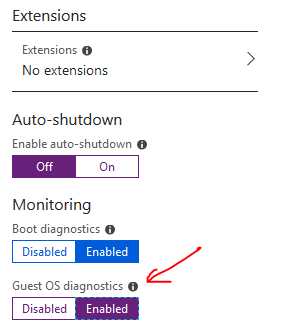 Make sure you enable Guest OS diagnostics. This will install LAD 2.3, which we will later upgrade to 3.0 . After the machine is created go to the Extension blade, where you should see the LAD 2.3 extension. On the Metrics blade of the VM you should be able to see all the available Guest metrics. As you can figure out, there are very few metrics and none about the filesystem usage. Now, to upgrade to LAD 3.0 you have to use a Linux machine where you must install Azure CLI 2.0 . Since our VM is already a Linux machine we can use this for this purpose. However, you can use any other Linux machine you have available, whether it is an Azure VM, local VM or a physical machine. The instruction to install Azure CLI 2.0 are very clear and straight forward and can be found on this link. Then edit the downloaded file and add only the highlighted lines (15-70) below, as the rest of the lines are here only to help you locate the correct position in the file. Now create the following script, providing the correct values to the parameters my_resource_group, my_linux_vm, my_diagnostic_storage_account and your_azure_subscription_id (see highlighted lines). # Build the VM resource ID. Replace storage account name and resource ID in the public settings. After you save the file, make it executable (chmod 755 installLad3.0.sh) and run it. You will be asked to visit a URL and enter a security code. Do it from any computer you like. You will be also asked to login with your Azure portal credentials. After you do so, close the browser window and return to your Linux machine where you executed the script. Be patient and allow the script to run for as long as required. On some high specs VM it may require less than a minute, but on some low end VMs or very busy ones, it may take much more. In one occasion I had to wait for about half an hour, but in the end the script run successfully and exited normally. So, I suppose at this point you have already run your script successfully. Now go to the Azure portal and check the extensions. You should see the LinuxDiagnostic extension at version 3.* . At the Metrics blade you should now see many more options for the Guest metrics. Among them, your custom metrics for the volumes’ free space. Based on these metrics you can create alerts as needed. Please leave a comment to let me know how this guide worked for you.